The “Mona Lisa” is one of the most important works of art in the world. The original that hangs in the Louvre. Thousands travel to Paris every year just to see it. And there is the “Mona Lisa with Rocket Launcher” that first appeared on the streets of London circa 2007. Both are pieces of content featuring the same woman. Both works are by famous artists. Both works are well-known in their own circles. What would happen if you replaced the original Mona Lisa with the Mona Lisa with Rocket Launcher? Unimaginable. Similarly, what if you replaced Mona Lisa with Rocket Launcher with the original Mona Lisa? Also unimaginable, but for different reasons. Context gives both works of their meaning. The Louvre is a place where patrons come to see collections from the most famous artists in the world, including a dozen works by Leonardo Da Vinci. The “Mona Lisa” would be out of place anywhere else in the world. 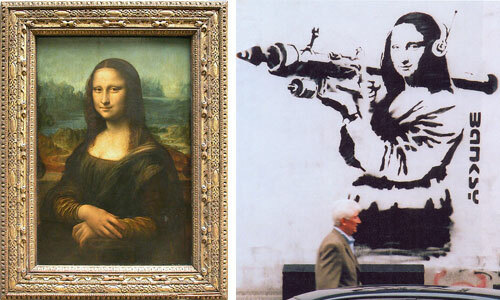 “Mona Lisa with Rocket Launcher” by Banksy belongs on the street and in pop culture. It would be equally out of place in a museum — at least until somebody in the future does a retrospective on Banksy’s career. Short form: context gives content more meaning. Context is just as important as content in everything that you produce as a marketer. Without it, your intent, message or call to action loses meaning. And when you lose those, you lose clicks, readers and potential customers. In today’s scan-first-read-later world, we have to understand importance or relevance immediately, or we move on quickly to the next thing on the list. It could be the next article, the next email or the next project. And we rarely return. By contrast, we’ll stop and make time when importance and/or relevance are clear from the outset. How do you create context? It’s easy either to miss or forget context. We’re trained as marketers to get out our message. But consumers are evolving and — rightly — becoming more demanding. The mass of marketing has led to finely tuned senses that look for context. Here are two ways to build context as you create content. Every journalist knows the 5 Ws: who, what, where, when and why. We’re trained to begin stories with all that are relevant. This helps create context for the reader. As you create content, I recommend focusing on who and why in the opening on your content before you focus on what. Readers respond better when they understand who is involved or why the content is important before you present the what that is the central message. I can’t remember where I saw this, but it’s a great question to ask yourself every time you sit down to write any content. Tapping into your customers’ aspirations creates the ultimate context. Once you prove you understand their challenges, they will come back again and again.